This is something I have wanted to try for years: to roast a whole cauliflower. Not only was it easy, but it was good. And because cauliflower is full of the powerful antioxidant, sulforaphane, it is good for you. Here are some interesting articles from John Hopkins Medicine on their sulforaphane research: autism, cancer, and general health. Reading this was enough to convince me to add broccoli sprouts to our daily greens! 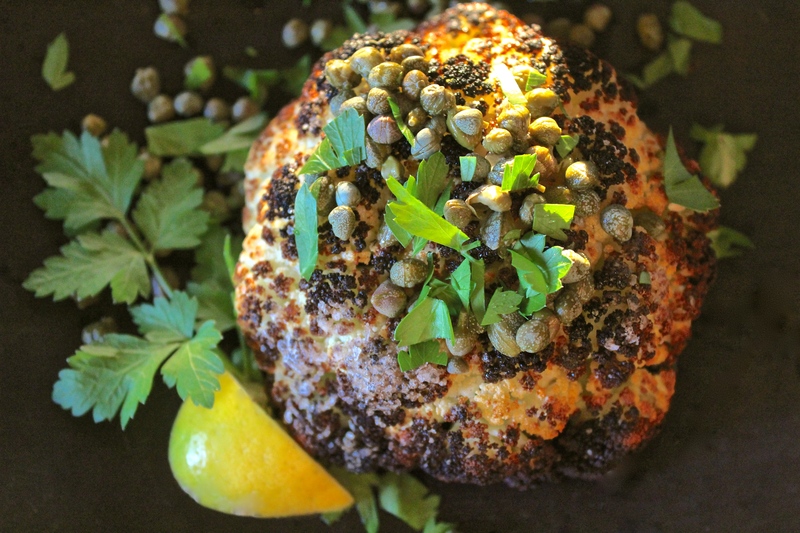 The cauliflower you see above is on the smaller side so it only took about half an hour in the oven at 400 degrees with some avocado oil and sea salt (a larger one may take an hour to become tender). I found a suggestion online to drizzle a mixture of lemon juice (and zest), capers, olive oil, and parsley over the cooked dome, which I highly recommend. On day 71 of this 365 day project, I ate my daily five (including this hydrating smoothie because the Spring wind is making my skin feel parched). Did you enjoy yours?